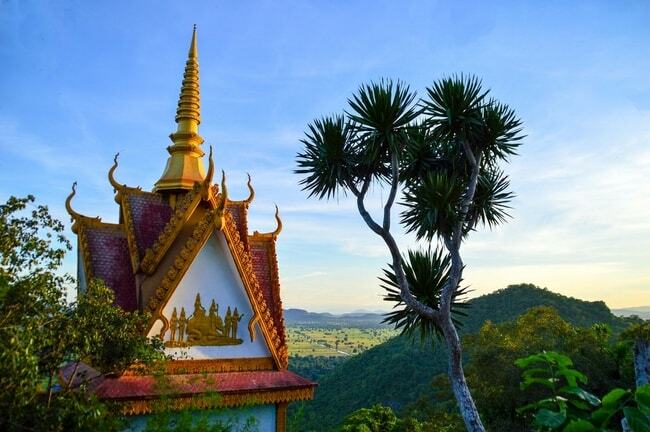 Dubbed the Rice Bowl of Cambodia, the northwestern province of Battambang is Cambodian countryside at its finest. It’s home to the country’s second largest – albeit laid-back – city of the same name, which is also the Kingdom’s cultural hub, meaning there is plenty to pack into 48 hours. Unfortunately, Battambang’s famous bamboo train stopped operations earlier this year, meaning this popular attraction is off the table for now. However, spend your first morning exploring the city on foot – its compact size and sleepy roads make it easy to navigate. There are several companies offering heritage walking tours, which take in the town’s wats, markets and a swathe of stunning colonial buildings that dot the town. Butterfly Tours runs a two-hour stroll led by Cambodian students. Alternatively, you can download a map created by Khmer Architecture Tours and go it alone. After working up an appetite, there are plenty of restaurants to choose from, but head to Café Eden – an American-run social enterprise – and refuel. Rent a tuk tuk and head to Phnom Sampeou, a mountain with temple Wat Sampeou sitting at its peak. Sitting about 12 kilometres from Battambang city, the journey includes sites of shimmering, palm tree-studded paddies, local villages and grazing buffalo. At Phnom Sampeou, visitors can explore the colourful temple – remember to keep your shoulders and knees covered while there; soak up the unparalleled views that stretch to the horizon and discover more about Cambodia’s recent past at the killing caves, where Khmer Rouge soldiers pushed people to their death. At about 6 p.m. each night thousands of bats pour out of a cave opening at the foot of the mountain, attracting crowds of onlookers. It’s a pretty incredible sight. No visit to Battambang is complete without eating at Jaan Bai. The Cambodian Children’s Trust-run social enterprise serves up some of the finest food in Cambodia and boasts a mouth-watering menu. If you fancy a nightcap, or three, then head to Madison Corner on Street 2.5. Rise early and immerse yourself in rural life on the back of a back with one of Soksabike’s tours. As a pioneer of responsible tourism, the company runs a series of half- and full-day trips that offer a glimpse into rural Cambodian life. Cycle through the pristine countryside, meet local families along the way and learn about the country’s culture and history. Feast on the homemade breads, crepes, sandwiches and delicious French-inspired desserts on offer at Choco L’Art Café ahead of spending the afternoon at Cambodia’s only winery, Banan Winery. Set 14 kilometers outside of the city, it welcomes visitors and offers tasting sessions – although, be warned, the wine fails to meet Western standards. Along with red and white wine, it also produces brandy and fresh grape juice. Spend the evening being entertained at Phare Circus – no need to fear, no animals are involved. Run by NGO Phare Ponleu Selpak – an NGO that trains underprivileged youngsters in a range of artistic skills – shows take in incredible acrobatics, gymnastics, juggling and other jaw-dropping feats. Indulge in some fine pizza and pasta at the city’s latest Italian restaurant, La Casa, before rounding off your 48 hours with some drinks at Ry’s Kitchen.